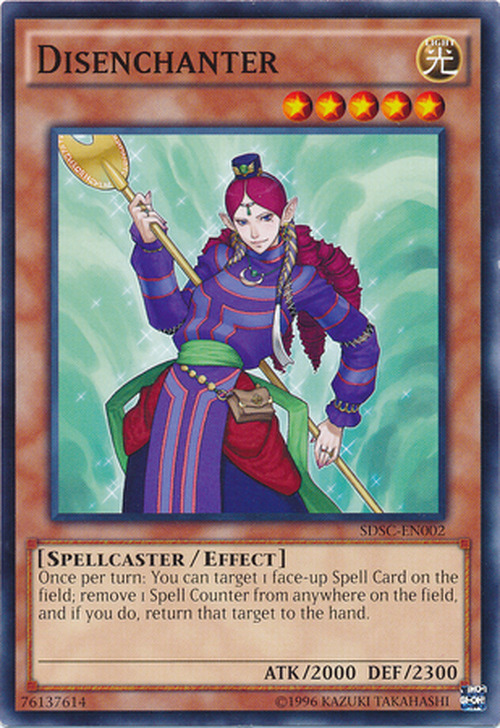 It is possible that this card might be an older or more powerful version of Magician of Faith, due to their similar appearance, effect, and name in the OCG (Magician of Faith is Saint Magician and Disenchanter is Saint Disenchanter). The effect targets one face-up Spell Card on the field. If there is no Spell Counter on the field when resolving the effect of "Disenchanter", then do not return the Spell Card to the Hand. : When resolving the effect of "Disenchanter", can the Spell Card be returned to the Hand if there is no Spell Counter on the field? The Spell Counter to be removed by the effect of "Disenchanter" is chosen at resolution. : When do you choose the Spell Counter which will be removed by the effect of "Disenchanter"? With the effect of "Disenchanter", you can remove a Spell Counter from your opponent's field. : Is it possible to remove a Spell Counter on the opponent's field with the effect of "Disenchanter"?